When you want a custom designed gunite pool, talk to the contractors at Landmark Swimming Pools. We have been in the business of inground swimming pool design and installation for three decades. When you want your pool design to truly reflect your personality, gunite should be your first consideration. Of all the inground pool materials available today, gunite is popular because it is highly durable and your pool can be created in just about any shape. Gunite swimming pools are not only versatile, they are built to last. Landmark Swimming Pools leads the pack when it comes to innovation, skill, and value as gunite swimming pool contractors. Gunite pools are constructed using a rebar framework that is sprayed over with a concrete and sand mixture. This method allows for a more versatile basin shape. A variety of custom colors and finishes can be sprayed into the basin to suit your taste. Select from an array of high-end finishes and patterns that contain flecks of pebbles and colored glass. Color coordinate your basin design with your choice of decking, and add optional enhancements such as waterfalls and custom steps. The flexibility of the material allows you to customize a swimming pool to your specific taste and budget. As we are a respected inground swimming pool contractor in greater Hartford, we will give you precise building terms and a construction timetable to ensure your project is completed properly and on time for your needs. 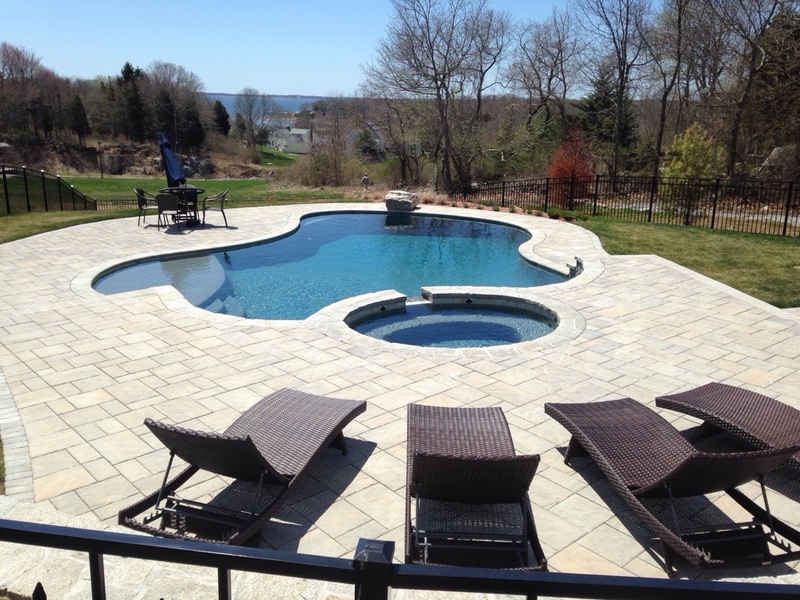 Landmark Swimming Pools has been the leading builder of custom in-ground swimming pools in greater Hartford for three decades. Our designers are looking forward to collaborating with you in planning your pool installation. The expert design and build team at Landmark has what it takes to create your beautiful back yard oasis. We will build you the pool you and your family are certain to enjoy for years to come. A full-service swimming pool company, we also offer pool and spa maintenance and repair services. The swimming pool contractors at Landmark design and craft your custom pool to complement the topography of your property. Landmark Swimming Pools creates custom in-ground pools, custom gunite swimming pools, salt water swimming pools, spas, and swimming pool repair. The Landmark team works with you from design through installation, maintenance and beyond. Call for a consultation today (800) 545-1460.